Pubblicato in: Atti del XI Convegno Società Italiana di Archeoastronomia, Il dentro e il fuori del cosmo. Punti di vista per interpretare il mondo. Bononia University Press, Bologna, 2013, pp. 67-75, ISBN 978-88-7395-866-6. Printed in: Atti del XI Convegno Società Italiana di Archeoastronomia, Il dentro e il fuori del cosmo. Punti di vista per interpretare il mondo. Bononia University Press, Bologna, Italy, 2013, pp. 67-75, ISBN 978-88-7395-866-6. At the beginning “The Archaeological Map of the Murghab Delta” was designed to carry out the systematic recording of sites and palaeochannels across the Murghab alluvial fan, to reconstruct landscape and settlement variations, before most of them would disappear for the expanding irrigation works from the Karakum canal. The activities of the project, beginning in 1990 and continuing through the present, have coexisted with, and had to adapt to, the deep environmental change brought about by the expansion of cultivated land and the strategies and methods of archaeological field work had to change gradually. The archaeological survey activities were initially concentrated in the southern part of the alluvial fan of the Murghab river and characterized by a great intensity. 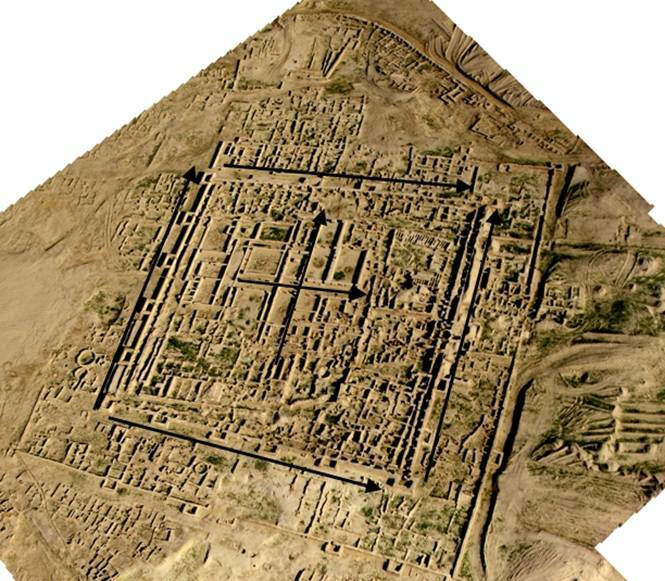 Only later on, the activities were extended to the rest of the fan and it was then possible to significantly enrich the catalogue of the archaeological sites, with the help of aerial photograph coverage and satellite images. The aim was to produce some reconstructions of the ancient river system and of the old branches of the Murghab that were active during the 3rd, 2nd and 1st millennia BC, and to establish a relationship between them and the peopling dynamics in that area. Turkmenistan is approximately 488 km2 in size, 387 km2 of which are covered by ten different types of deserts. The Paropamiz and Kopet Dagh mountain ranges and plateaus frame the country’s south-western border. The main rivers are the Amu Dar’ya, Tejen and Murghab. The source of the latter river lies in the Hindukush of Afghanistan and it transverses Turkmenistan from south to north and flows through the south-eastern desert of the Karakum. Progressively dryer climatic conditions and resulting desertification have greatly reduced the extent of the Murghab alluvial fan over the past five millennia. 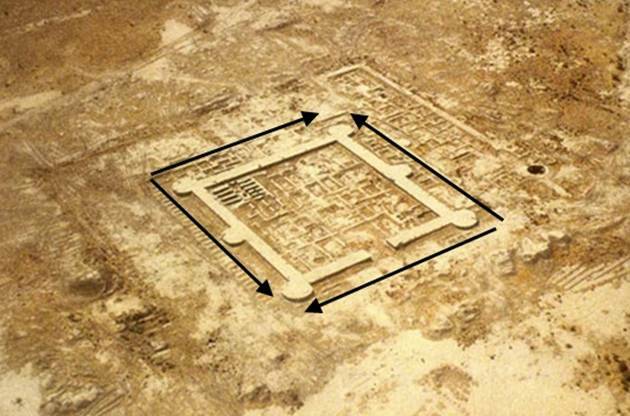 For this reason, the majority of archaeological sites are now located in the desert. Fifteen years of surface survey in the Murghab alluvial fan have demonstrated the importance of GIS technologies to reconstruct the profiles of the ancient landscapes in this region and to collect more then one thousand archaeological sites. By employing historical maps and survey transects integrated through orthophotography from aircraft and space as well as oblique flights, we have been able to gain a much better understanding of the ancient landscape of the Murghab river. For the present research, concerning investigations to detect the archaeoastronomical measurements of the architectural structures in the ancient time, we selected four archaeological sites, respectively Gonur-depe (Middle Bronze Age-MBA 2400-1950 BC), the ancient capital during the Middle Bronze Age, Gonur South (Themenos) (Late Bronze Age-LBA 1950-1500 BC), Togolok-21 (LBA 1950-1500 BC) and Merv (Iron Age 2-IA 2 900-550 BC – XIII AD) (Big Kiz Kala, Shahryar Ark palace and Imaret-Pavilion), the ancient capital of Margiana, to have an idea of the employment of such techniques. The measurements – got by a graduated spherical surveyor’s cross that determines astronomically (i.e. very accurately) the azimuths of the surveyed objects – are based on the relative immutability of Sun and Moon seasonal positions on the skyline for several millennia. This is not the case of the stars! Indeed, their positions change considerably (about 1° in 72 years) and it is necessary to develop long and complex calculations to reconstruct their secular movements. Moreover, possible settings in a row of stars must be estimated by probabilistic methods. We measured this site from the structure of the internal walls surrounding the palace and the ruins of the palace. The east and west walls are oriented along the N-S line, with a medium axes of 2°16’ « 182°16. The northern side of the walls are oriented along the E-W line with an azimuth of 89°46’ « 269°46’. On the other hand, only the southern wall was built with a little digression in azimuth, quantifiable at about 6.5 degrees (275°44’). This difference could be intentional and this subject deserves further research. The walls inside the ruins, as well as the palace, were built almost exactly in orientation with the four cardinal points (azimuth 0°41’ « 180°41’ and 90°41’ « 270°41’). The internal walls are oriented approximately N-S-E-W, with an azimuth of 351° « 171° and 81° « 261°. These differences from meridian and equatorial axes are the result of a precise research, carried out by the builders using positional astronomy. As I discussed briefly, these orientations let the observer see many astronomical phenomena. It was not possible to take astronomical measures of the more external walls because of the poor conservative state of these structures, but they reflect basically the orientations of the internal perimeter. c) SE tower corner: rise of the Moon at its southern utmost amplitude, the other position that it reaches every the above mentioned cycle of 18,61 years. d) W side. NW tower: Moon setting at its northern utmost amplitude; NE tower: still doubtful at the moment; probably stars. 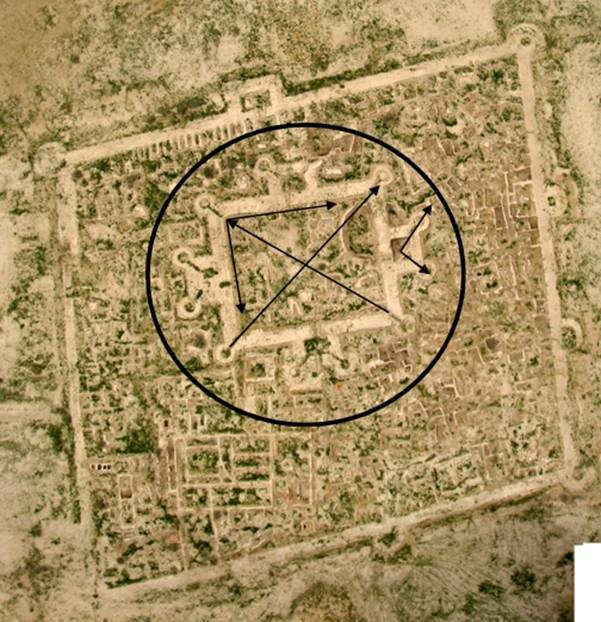 It is possible to infer that the Themenos of Gonur South is a Moon and Sun observatory. Now we are developing the calculations related to stars and constellations. (photo by G. Davtian, published with kindly permission of V.I. Sarianidi and N.A. Dubova). The astronomical survey of the town and external perimeter walls shows that they are oriented, almost exactly, towards the four cardinal points (azimuth 359°17’ 179°17’ and 90° 11’ « 270°11’). Therefore it was possible to determinate equinoctial axes, solstice rising and setting points and astronomical midday observing the culmination of the Sun above the horizon. More researches need about the intermediate positions 45°, 135°, 225°, and 315° and conclusive outcomes will be published as soon as available. (photo published with kindly permission of V.I. Sarianidi and N.A. Dubova). The Big Kiz-kala was built to match both the direction of the summer solstitial sun rising and the winter solstitial sun setting. It is possible to observe these positions through the big holes in the walls of the structure. Figs. 4-5 - The Big Kiz-kala fortress (photos by H. De Santis). The minor axes of Shahryar Ark’s building are roughly oriented like the equinoctial line, with an azimuth of 96° « 276°. Finally, the Imaret-Pavilion does not match particular directions, but was roughly built towards the summer solstitial sun rising and the winter solstitial sun setting with an error of 6°. Figs. 6-7 The Shahryar Ark palace (left side) and the Imaret-Pavilion (right side) with indication of measurements (photos by H. De Santis). The most interesting outcomes are the azimuths of Gonur-depe and Togolok 21. 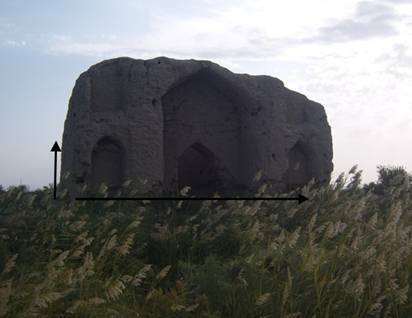 The Azimuth difference among east and west walls of Gonur–depe and Thuban (α Draconis) in 2400 BC (Thuban’s maximum digression was 2°51’26.25”) is only 0°35’26.25”. Therefore we can think that, like in Lothal, the builders got this setting in a row using the Polar Star of their age, i.e. Thuban. These orientations do not seem random. As I wrote in another my report, there are several methods to point a building towards the four cardinal points, but only the stars get the best outcomes. 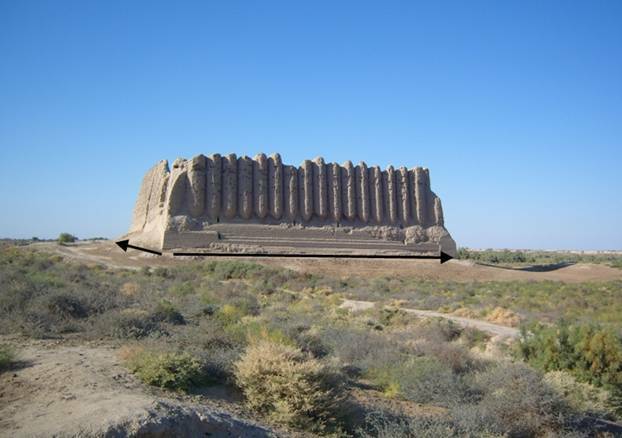 The most careful N-S orientation of the walls inside the ruins could be got by observing the upper and lower culmination of Thuban instead of its maximum digression. Because Togolok 21 belongs to the same cultural horizon, although half millennium more recent, we can think – like a working hypothesis - that the four cardinal point setting in a row was a local uninterrupted tradition. 8) the Etrurian town of Marzabotto – 5th century BC - in Italy. Leaving out the monuments with uncertain (Nos. 3, 5, 6) or later (Nos. 4, 8) age, the alignments towards the four cardinal points seem to be a widespread tradition in the 3rd millennium BC, although less followed in Europe. Indeed, European megalithic monuments were oriented towards solstitial and lunistitial points much more frequently. A working hypothesis is that Egyptian and Asian peoples knew already the equinoctial precession, whereas European peoples, unaware of it, used only Sun and Moon movements to measure the time. A long research of mine, with two others authors (Bianchi E. e Veneziano G.), is showing that ancient middle Eastern peoples knew and used probably the equinoctial precession since the 4th millennium BC. Moreover, it is well-known that China, according to its ancient and autochthonous religion, is in the middle of the four cardinal points and the polar axis. Therefore it needs to look for other cardinal alignments and to reflect, if found, on their meaning and incidence on the ancient cultures, particularly in the 3rd millennium BC. Burl A. (1993), From Carnac to Callanish, Yale University Press, New Haven and London. Cerasetti B. (2012), Remote Sensing and Survey of the Murghab Alluvial Fan, Southern Turkmenistan: The Coexistence of Nomadic Herders and Sedentary Farmers in the Late Bronze Age and Early Iron Age. In Matthews R. - Curtis J. (eds) Proceedings of the 7th International Congress on the Archaeology of the Ancient Near East 12 April – 16 April 2010, vol. 1, London, 539-558. Codebò M. (1997), Prime indagini archeoastronomiche in Liguria, Memorie S.A.It., 68(3), 735-751. Codebò M. (in press), Il calcolo FK4 B1950.0 della precessione delle stelle, Atti del XIII Seminario A.L.S.S.A. di Archeoastronomia, Genova. Codebò M. (submitted), The knowledge of the aequinoctial precession before Hypparcus, Atti S.I.A. 2009. Codebò M. - De Santis h. - Frenez D. (submitted), Archaeoastronomical surveys in Lothal, Atti del XI convegno S.I.A. Gubaev A. - Koshelenko G. - Tosi M. (eds) (1998), The Archaeological Map of the Murghab Delta, Preliminary Reports 1990-95, Reports and Memoirs, Series Minor, III, Roma. Hadingham E. (1978), I misteri dell’antica Britannia, Newton & Compton, Roma. Herrmann G. (1999), Monuments of Merv: traditional buildings of the Karakum, Reports of the Research Committee of the Society of Antiquaries of London, London. Herouni P. M. (2004), Armenians and old Armenia, Yerevan. Herouni P. M. (2009), L’osservatorio preistorico di Carahunge in Armenia. In Codebò M. (ed. ), Atti del Convegno Internazionale “Archeoastronomia: un dibattito tra archeologi ed astronomi alla ricerca di un metodo comune”, I.I.S.L., Bordighera (IM), 88-95. Kozhein P. M. – Kosarev M. F. – Dubova N. A. (eds) (2010), On the Track of Uncovering a Civilization. A volume in honor of the 80th-anniversary of Victor Sarainidi. Transactions of the Margiana Archaeological Expedition. Sankt-Petersburg. La Porta C. - Magli G. (2003), Piramidi, Stelle, Megaliti, Newton & Compton, Roma. Magli G. (2005), Misteri e scoperte dell’archeoastronomia, Newton & Compton, Roma. Meeus J. (1990), Astronomia con il computer, Hoepli, Milano. Proverbio E. (1989), Archeoastronomia, TETI, Milano. Romano G. (1992), Archeoastronomia Italiana, C.L.E.U.P., Padova. Ruggles C. (1999), Astronomy in prehistoric Britain and Ireland, Yale University Press, New Haven and London. Salvatori S. - Tosi M. (eds) (2008), The Bronze Age and Early Iron Age in the Margiana Lowlands. Facts and Methodological Proposal for a Redefinition of the Research Strategies. The Archaeological Map of the Murghab Delta, Studies and Reports, II, British Archaeological Reports 1806, Oxford. Sarianidi V. I. (1990), Drevnsoti strany Margush. Askhabad. Sassatelli G. (1992), La città etrusca di Marzabotto, Grafis Edizioni, Casalecchio di Reno (BO). Schiaparelli G. V. (1998) Scritti sulla storia dell’astronomia antica, vol. 3, Mimesis, Milano. Gubaev A., Koshelenko G., Tosi M. (1998); Salvatori S., Tosi M. (2008). Karakum canal is one of the largest irrigation and water supply canals in the world, carrying water from the Amu Dar’ya river across the Karakum desert in Turkmenistan. For Gonur-depe and Gonur South, see Sarianidi, V. I. (1990); Kozhin P. M., Kosarev M. F., Dubova N. A. (eds) (2010) and the previous literature. The Themenos, as Sarianidi names it, is a great religious complex that may have served the entire region in the later Bronze Age. 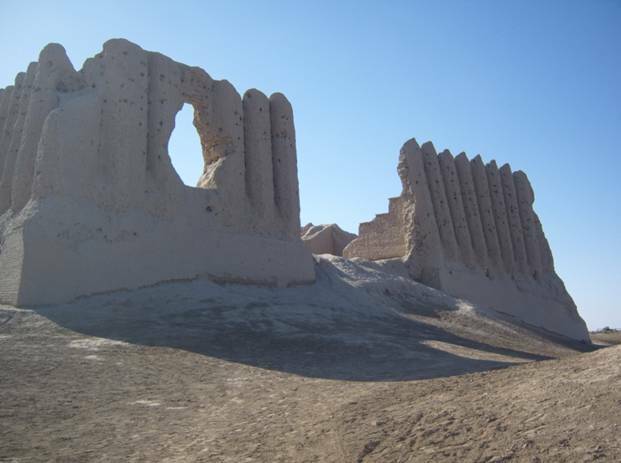 Actually Merv is a group of sites of different periods and among them we have: Big Kiz Kala (VI century AD), an Abbasid semi-fortified two floors palace with corrugated walls; Seljuk palace (XI AD) located at the centre of Shahryar Ark, the citadel of the site of Sultan Kala; the Timurid Imaret Pavilion (XIV AD). For a complete description of the monuments of Merv, cf. Herrmann, G. 1999. 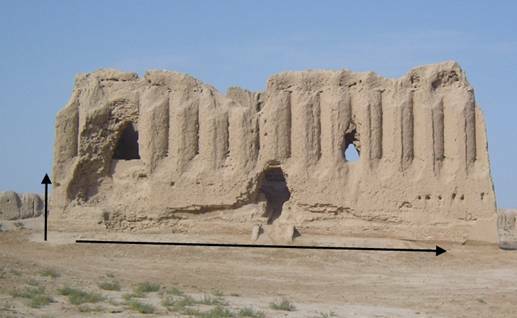 One of the satrapies of the Achaemenid Empire, corresponding to the eastern Turkmenistan, and more precisely to the large alluvial fan of the Murghab river. A special thanks goes to V.I. Sarianidi and N.A. Dubova for their kind support and the permission to measure the structures in Gonur North and South. I would like to thank also M.A. Mamedov and his staff of the Ministry of Culture of Turkmenistan for the help given to the Italian archaeological mission. The amplitude is the distance of rising (rising amplitude) and setting (setting amplitude) points of a heavenly body from the East and West cardinal points. Because Thuban’s declination δ > Gonur-depe’s latitude φ, Thuban does not cross its first vertical (i.e. the great circle passing through the points East, West, Zenith and Nadir), but it gets its maximum digression (Flora 19875, § 52), i.e. the greatest distances from the meridian eastward or westward. Codebò M., De Santis H., Frenez D. (submitted). For instance, it is possible to use also a disk tilted like the ecliptic (the Zodiac by night): its uppermost point corresponds to the local meridian (E. Campagnoli and A. Baudà, personal communication). Proverbio E. (1989, p. 47); La Porta C., Magli G. (2003, p. 43); Magli G. (2005, pp. 358, 372). Hadingham E. (1978, p. 169); Cossard G. (1993, p. 63) Burl A. (1993, p. 117). Hadingham E. (1978, p. 109); Cossard G. (1993, p. 87); Ruggles C. (1999, pp. 134-136). Codebò M. (1997, pp. 740-741). Codebò M. (1997, pp. 744-745). Carahunge archaeological age is 3rd - 2nd millennium BC, according to some tombs and a settlement, whereas its archaeoastronomical age is 5500 BC, according to Herouni (2004, pp. 7-8). But Herouni’s four astronomical calculations puzzle me. Herouni P. M. (2004, p. 10); (2009, pp. 88-97). Romano (1992, p. 86); Sassatelli (1992, p. 33). Moreover, the orientation of the four sides of Crocuno towards the four cardinal points is the obliged consequence of its two diagonal orientation towards solstitial sun rising and sun setting points at that latitude. Callanish – like Stonehenge and St. Martin de Corléans - was built during a very long time. Its first and last buildings date back, respectively, to 2900 BC (Ruggles 1999, p. 135) and to 1550 BC (Burl 1993, p. 180). Egyptians knew and used the Sothiac cycle of 1451 years, i.e. the Sirius heliacal rising precisely at the same day: 1st Toth, which was their “New Year’s Day” (Schiaparelli G. V. 1998, pp. 73-82). The original English version is Meeus J. (1988), Astronomical Formulae for Calculators, Willmann-Bell Inc., Richmond, Virginia, U.S.A.